As you should know by now, I’ve been a folding pocket knife enthusiast for quite a long time and love to put some of the more popular knives through their paces. I generally use my pocket knives on a daily basis and usually won’t carry one that doesn’t demonstrate practical functionality for my everyday needs as well as bringing something to the table when it comes to self-defense. The Kershaw Ken Onion Blur folding knife fits my needs on paper, but as I began to use it I found it does have a few minor (and one not-so-minor) drawbacks. While excellent value for money, the Blur has a few failings which make it fall short of the competition. Kershaw was founded in 1974, and has always aimed to design and manufacture tools that knife users would be proud to own, carry and use. Kershaw prides itself on making sure that every Kershaw knife is made to the highest quality. Kershaw has also pioneered the use of quite a few of the technologies and advanced materials that are now a standard in the knife industry. Ken Onion, who designed the Ken Onion Blur, is an American award-winning custom knifemaker from Kaneohe, Hawaii. He invented the “SpeedSafe” assisted opening mechanism used on Kershaw Knives, and served as the Premier Knife Designer for Kershaw Knives. The Ken Onion Blur looks very similar to several other modern pocket knives these days, with its tactical-style appearance and discreet pocket clip. However, what sets this aside from many is that it features the SpeedSafe opening system and a torsion bar that helps keep the knife locked. To open the knife, you apply pressure to the thumb stud and rotate the blade out of the handle. Once the blade is clear of the handle, the torsion bar moves along the track and takes over, flipping the blade the rest of the way open smoothly until it locks into place. Pretty nifty overall. The model I reviewed is constructed of Sandvik’s decent 14C28N stainless steel, and features a 3-3/8” smooth blade. The handle on my model is olive drab, made of 6061-T6 anodized aluminum with Trac-tec inserts. It has the SpeedSafe opener, a liner lock locking mechanism, and a pocket clip that can be adjusted to have the tip of the knife either up or down. The weight is just over 4 ounces so it’s a little on the heavier side for an EDC. As with many of their other offerings, Kershaw spoils you for choice on this one too. 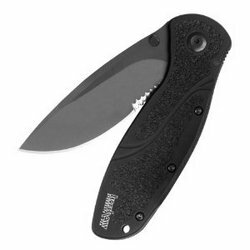 The Blur pocket knife is available with either a smooth blade or a serrated blade. It also comes with a variety of handle colors too, including the olive drab model that I purchased as well as desert sand, red, and black. More advanced models of the Blur include the Glassbreaker, which has a carbide tip built into the handle for breaking windows, a top end model with a nice S30V powdered stainless steel blade, and a black DLC coated blade. Kershaw also manufactures a model with a modified tanto blade, partially serrated, for more tactical purposes. Also, you may be lucky enough to get your hands on one of the coveted Blue Kershaw Blur’s which were produced in limited quantities back in 2008. Before I get into the meat here let me say that one of the nicest features of the Blur without doubt is the SpeedSafe opening mechanism. This is a spring-assist opener that has wonderful deployment speed, flipping the blade open in a fraction of a second with ease. The thumb studs are very well-crafted, allowing the Blur to be opened in, well, a blur. It only takes a little bit of thumb pressure, which even my arthritic grandfather could muster to open this knife. The Ken Onion Blur is really perfectly-sized too. Its small frame makes it easy to palm and keep slightly concealed, but the blade is long enough and sharp enough to be useful for both everyday situations and self-defense purposes. My Blur doesn’t have serrated edges, but I’ve heard from other users that the serrations are wicked sharp. The grip on this knife is also very good, featuring an almost soft rubbery silicone grip tape along the outside that helps you keep a tight grip on your knife. This is the Trac-tec and it does a good job of feeling comfortable yet ‘grippy’. Still not perhaps as nice as G-10 overall but I applaud Kershaw for trying something new here while keeping the costs down. The pre-drilled holes in the handle allow you to switch the pocket clip for either tip up or tip down carry. Now, on to the blade. The blade on this knife is razor-sharp straight from the factory, and it holds a sharp edge even after some abuse. It’s a drop point shaped blade with hollow grind and a small recurve. Generally I don’t find a recurve to be good for anything but additional aggravation at sharpening time. Thankfully in this case it is very slight. The edge is great for cutting boxes, tape, rope, and I’ve even put it through a car hood of a wrecked 1976 Chevrolet Impala. Of course, I had to sharpen the blade after going through the steel of the car hood, but that was to be expected. The Sandvik 14C28N steel is in the same category as a 440C or AUS-8 which I describe as upper mid-range. Not bad for the price. Sadly, this knife isn’t without its problems, though. The thumb button is a bit small and tough on the thumb after repeated openings, even though it works well to open the knife. I would like to see the thumb stud a tad bit larger, but not by much. As for the toughness on the thumb, any changes to the design would probably make it much more difficult to open the knife, and not many people will be flipping the knife open and closed repeatedly in normal usage. The pocket clip on the Ken Onion Blur is really, really tight. It’s so tight that when you draw the knife from your pocket, your pocket will try to come along with it. That said, my last Gerber knife suffered from the clip not holding tight enough; I think I’d rather have it too tight rather than not tight enough. The last drawback is a bit more serious as it related to the locking mechanism’s proneness to failure. The liner lock failed on me as I was cutting into a block of wood which resulted in the knife closing and cutting into my hand. Fortunately the wound wasn’t too bad but enough to make me seriously question the reliability of the lock up on this knife. Now I admit this only happened once after some heavy duty usage but I find it hard to overlook something like that. Overall, Kershaw has built a good looking knife that holds an edge quite well and is useful for daily use as well as self-defense. The razor sharp stainless steel blade will cut through just about anything, and I regularly used mine for skinning deer, cutting open boxes, cutting apart boxes, and even cutting paper. If I were stuck in the wilderness without my razor, I could even use the knife to shave. Unfortunately, I lost some confidence in the liner lock locking mechanism with heavy duty applications so you need to be very careful with this knife in that respect. Still, it’s a decent knife at a reasonable price point if you stick to light use. That said, I can’t help feeling you could do better at this price point with one of Kershaw’s competitors.